When one thinks about the interior design of a place of worship, one generally includes statues of religious icons, paintings of important religious events, perhaps the odd stained-glass window and altar or shrine dedicated to the deity in question. An interior adorned with bones of the dead does not readily spring to mind. But some creative designer conceived of and created just such morbid décor for a chapel in Portugal. The Capela dos Ossos (which translates as ‘Chapel of Bones’) is a chapel located in Évora, in the southern central part of Portugal. This chapel dates to the 16 th century, and is part of the Igreja Real de São Francisco (the ‘Royal Church of St. Francis’). The chapel was founded by the Franciscans, a religious order within the Catholic Church, and its interior walls are decorated with human bones, hence its name. Today, the Capela dos Ossos is one of the best-known and most popular monuments in Évora. The history of the Capela dos Ossos begins in the 16 th century. During that period, there were as many as 42 / 43 cemeteries in Évora. This meant that much valuable land was being wasted. Instead of being used for more productive activities, for instance, agriculture, or the construction of buildings, these plots of land were being used to bury the dead. At some point in time, it was decided that some of these cemeteries should be destroyed, and re-used for more productive purposes. As a result of this, the Franciscan friars who were living at that time decided to collect the bones of the departed, and have them reburied at a different place, so that their souls may be saved from condemnation. In certain cultures, the secondary burial of bones was a common practice. Whilst the Franciscans could have interred the exhumed bones behind closed doors, they decided to do something quite different. During the 16 th century, the Counter-Reformation was in full swing in Catholic Europe, and the various religious orders were playing a role in it. 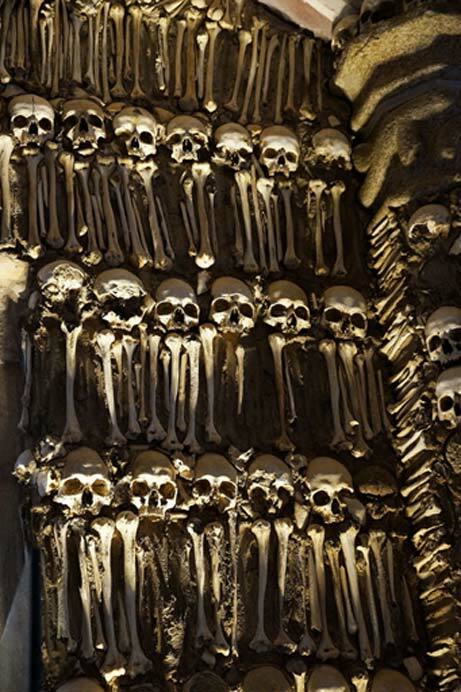 The Franciscans of Évora, in the spirit of the Counter-Reformation, decided to inter the bones in a chapel where they would be on display for all to see. The Franciscans hoped to provoke visitors to the chapel into thinking and contemplating about the ephemerality and fragility of human life, as well as the inevitability of death, as they were concerned about the declining social values of the city’s inhabitants. It has been pointed out that the design of the Capela dos Ossos was inspired by the San Bernardino alle Ossa in church in Milan, Italy, best known for its ossuary. For the Capela dos Ossos, an estimated 5000 corpses were exhumed, and then used by the Franciscans to decorate the walls of the chapel. 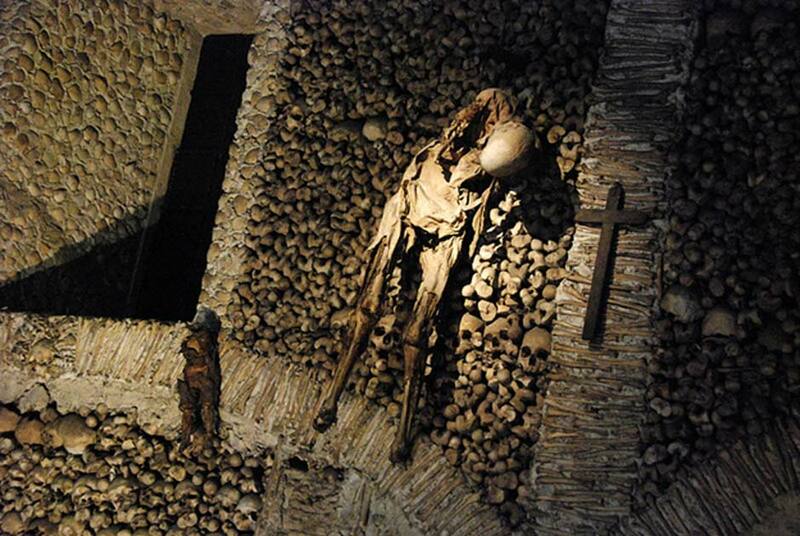 According to legend, these bones once belonged to soldiers who died at a major battle, or were the victims of a plague. In reality, however, the bones came from ordinary people who were buried in Évora’s medieval cemeteries. In any event, the Franciscans arranged the bones in a variety of patterns. Apart from the bones, there are several other features to look out for at the Capela dos Ossos. One of these, for example, is the written messages displayed in the chapel. The most famous of these may be found above the chapel door, and visible to all who enter. This message, written in Portuguese, reads “Nós ossos que aqui estamos, pelos vossos esperamos”, and translates as ‘Our bones that are here wait for yours’. Another curiosity in the Capela dos Ossos are two desiccated corpses, one of an adult, and another of a child, both of which are hanging on ropes from a wall. There are various stories surrounding these two individuals. According to one, the two corpses belonged to a woman and her child. As they had been cursed by a powerful man, they were refused burial in the local cemeteries, and eventually found shelter in the chapel. According to another story, the adult corpse belonged to an adulterous man, and the child his infant son, both of whom were cursed by the man’s enraged wife. Surprisingly, this is not the only chapel of bones to be found in Portugal. Another lies way down south in Faro which is similarly adorned but with only the bones of the monks which is arguably even more gruesome as it includes a skull shrine.